Order for the beginner or the veteran sketch artist, this complete professional drawing and sketching art set is sure to delight. weight, non-smudge professional sketching paper, this artist set is ready for action. Set comes in a durable zippered nylon carrying case. · We offer a 2-year warranty so that you know you'll receive satisfaction and value with our sketching kit. √ BEGINNER TO PROFESSIONALS: with this deluxe sketch and drawing kit you can begin drawing as soon as you open the box. Complete drawing supplies and artist pencils with a sketch pad of medium weight, non-smudge professional sketching paper by Cool Bank, these art kits are ready for action. Sketching supplies Includes charcoal pencils for drawing. Perfect art set for adults and kids. √ WIDELY USE: This Cool Bank versatile art kit is perfect for both students, hobbyists who love scrapbooks and even professional drawers working on craft or construction paper, detail sketching and high-level artistic skills, it is best tools to showcase someone's awesome drawing talent. 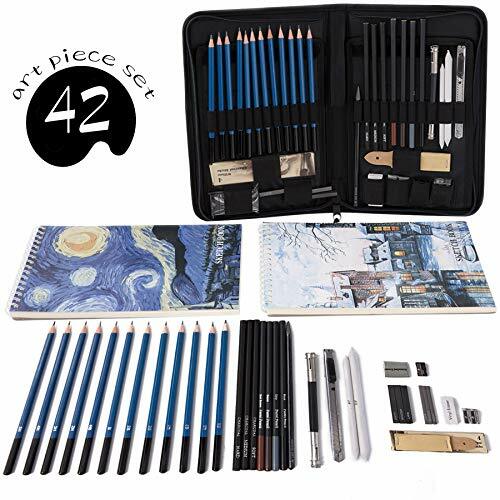 √ TRAVEL SIZED KIT: This art set features a zippered pencil case, compartmentalized for all the art pencils, that are included with this professional drawing set. Artist supplies for anyone: kids art supplies to arts and crafts for adults - these art sets are sure to please! Gift this drawing kit for kids and start someone down a creative path, equipping them with their first drawing pencil and complete sketching pencil set. √ QUALITY GUARANTEE: Cool Bank Art Supplies represents superior quality and customer service with your highest satisfaction or a money back guarantee. We are confident you will enjoy these art sets, complete with a pencil set, and all other items the sketch artist needs. All the art supplies for artists in one place!